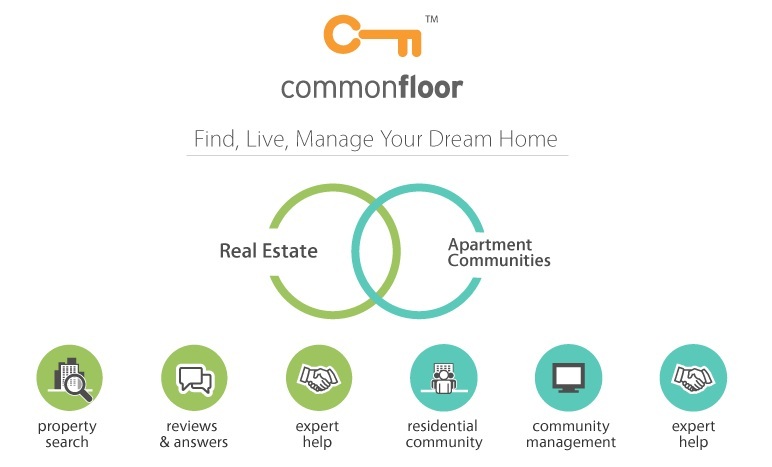 CommonFloor.com, its journey starts from 2007 to become India’s largest residential community portal. It started from a garage, till date it has assisted over 100,000 communities covering of over 400,000 houses and has upheld its presence across 120 cities in India. 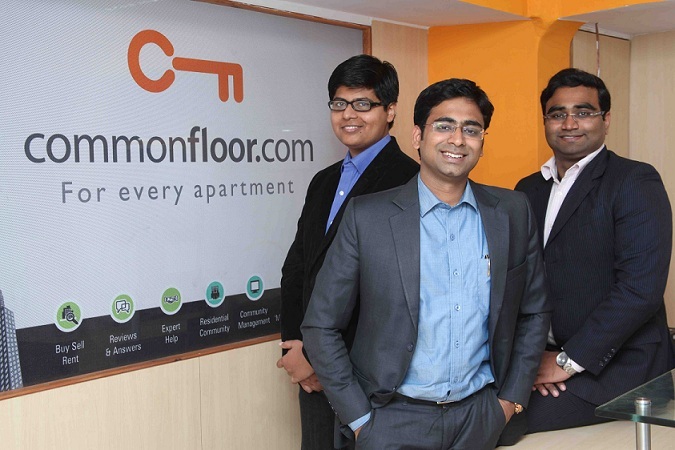 CommonFloor.com was founded by Vikas Malpani, Sumit Jain and Lalit Mangal. It reports issue of house hunting and has created a platform that originates translucent information about all aspects of the real estate market. It is also a platform for communicating with other members of the community one is resides in. It all happened when they first came to Bangalore in 2007 and couldn’t hunt the right accommodation. It had been terribly exhausting to search out an accommodation and solve any problems associated with it. After countless hitches they found an apartment but to their bad luck, several new problems cropped up which all had their seed within the process of shifting to a new house. In their case, it had been a sewage issue in the society which wasn’t getting resolved because none of the society residents knew each other or had any kind of co-ordination to come to a conclusion. Aware of to these issues, the trio of Sumit, Lalit and Vikas had realized the core of the real-estate problems in India and so was born CommonFloor. Revenue model of commonfloor is cost per lead. They provide their services free to users and charge businesses (for using Apartment Management Software). They generate revenue from advertising and vendor listings. Various famous players across many horizons such as real estate and banking services advertise with them to reach out to individuals who are looking to buy or sell property. Vendors like architects, plumbers, carpenters etc. also approach them to reach out to the house owners via advertising. As far as marketing strategy goes, CommonFloor has a radical and a pretty confidant tactic to it. Their marketing mantra is to have a worthy product that enough to keep them ahead in competition. The precision of the data led to positive word of mouth, which has helped commonfloor to gain success. They are also focused on sharing significant content on their website which has helped in gaining more users. CommonFloor.com allocates approx. 70 % of its marketing spends on television and print, the rest is dedicated to social media activation. The key aim of Live-in Tours is to deliver property seekers a 360-degree view of the property, right from wall-to-wall and ceiling to floor. Another innovative marketing strategy was the portal’s association with the lately released film Katti Batti starring Imran Khan and Kangana Ranaut. CommonFloor was integrated in the script of the film, wherein the characters choose their dream house with the help of the commonfloor portal. Commonfloor was the first ones to tie up with The Viral Fever and one of their series “Permanent Roommates”, which attracts to huge audience. This kind of wonderful link up with the films and TV serials was quite a worldwide success. Movie & serial integration and initiation helps link with audience on ground as well as strengthen the brand. Commonfloor.com has launched its first TV commercial with the tagline – “No Darr. Find Ghar”. Entertaining and amusing, CommonFloor.com tries to remove all fear related with property decision making. This TVC showcases the key benefits of CommonFloor.com like complete choices, correct information, deep visions, easy-to-use tools and innovative technology. Commonfloor have striking a momentous presence in the world of social media. This company spend approx.25% of the total amount in digital marketing. Commonfloor has a huge 187 K fan following on Facebook and more than 20.7K followers on Twitter. Instagram witness more than 272 K followers. YouTube Channel of commonfloor has around 1,879 subscribers. Digital marketing options in social media like Facebook, Twitter and Instagram are being used to reach out to target clients. Social media is more about putting out the right information, keeping the audience engaged to company pages. Commonfloor interact with people on Facebook and Twitter, who are looking for a house and connect them with relevant options. Buyers are promoting their projects via social media platforms and running effective media campaign. Social media offers more flexibility to the campaign as they provide the buyers with the prospect to know the views of home buyers. Viral marketing has occurred as an able tool for buyers to build up user interest. Commonfloor has raised fund from Accel Partners in 2009. Commonfloor raised another round of funding and this time from Tiger Global Management, a New York-based investment firm along with their existing investor Accel Partners for an undisclosed amount. Commonfloor has raised Series C round of funding from their existing investors worth $7.5 million in 2013. Recently, CommonFloor.com has raised $15 million in its Series F round of funding from Google capital. The firm has raised Series B from Accel Partners and Tiger Global, $10.4 million in Series D led by Tiger Global and $30 million in Series E led by Tiger Global. Bangalore-based online classified’s portal Quikr has acquired real estate platform Commonfloor. The deal has valued Bangalore-based Commonfloor at around $100 million. It is a complete share-swap deal, and no cash has been exchanged. Commonfloor will get a little less than 8% stake in Quikr. The deal will create one of the biggest online real estate listings platform in India. Commonfloor are the fastest growing real estate portal in the country growing by more than 100% year on year as per report. Their revenue has been growing by more than 100% every quarter and they aim to achieve a turnover of $25 million in the next two years. Today, they have more than 100,000+ projects listed on their portal and this are the largest compared to any property portal in India. The number of property listings has grown by more than 500% in the past financial year and they currently have more than one lakh live active listings. Now after completing long journey of 7 years, the portal covers nearly 500,000 active listings, 100,000 communities in 120 towns and cities which include Jaipur, Chandigarh, Lucknow, Nagpur, Indore, Ahmedabad, Kochi, Coimbatore, Mysore, Kolkata, Mangalore, besides Bangalore, Mumbai, Noida, Gurgaon, Chennai, Hyderabad, Pune, etc. The startup is also planning to scale the marketing skill in the existing 18 cities and also add four more cities in the coming months. They also have plans to upsurge their frontiers to overseas such as the United States of America, the United Kingdom, and the United Arab Emirates, Singapore, and South Africa. With such a massive and constant accomplishments noted, there is no uncertainty about Commonfloor being called “Real Estate Giant”.